A few months back, the sister was feeling generous and decided to give the brother, M and I a treat at Saveur, a gem she uncovered recently (Back then. She has since uncovered many other new gems and you can check her blog here. She blogs about fashion, books, films and music too. She's the artsy one in the family. (: ). The nearest station is Bugis and it's one street and a few steps across the National Library. Saveur doesn't take in reservations so if waiting long is not your thing, do make sure you go early. We reached the place around 11.30am, on a Friday. 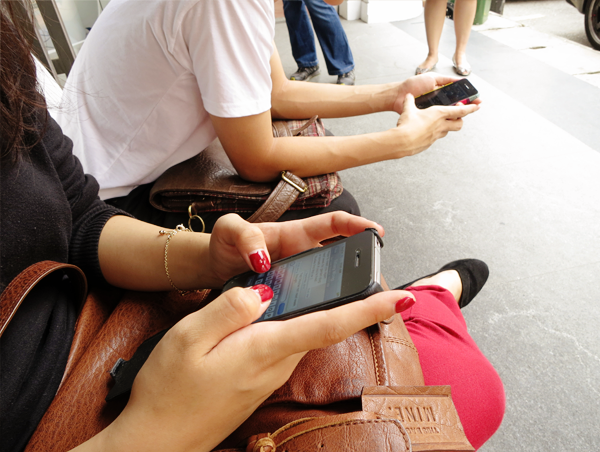 After leaving our names at the front desk, we sat on the chairs lined outside and of course, whipped out our gadgets. Noon came and we got our seats immediately. 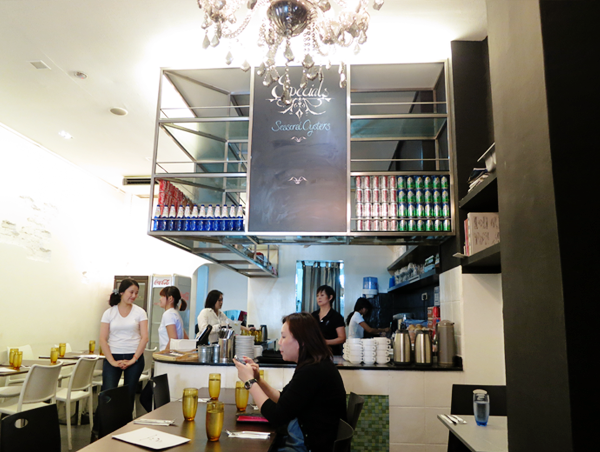 Saveur takes up two rectangular rooms. The place is adorned with chandeliers and has torn walls, with red bricks peeking out of them. Simple and classy. The tables were taken up quickly, by many in suits. 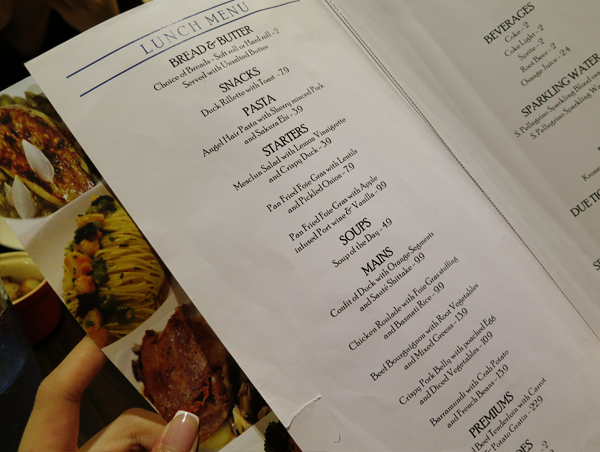 Here's shot of the lunch menu. 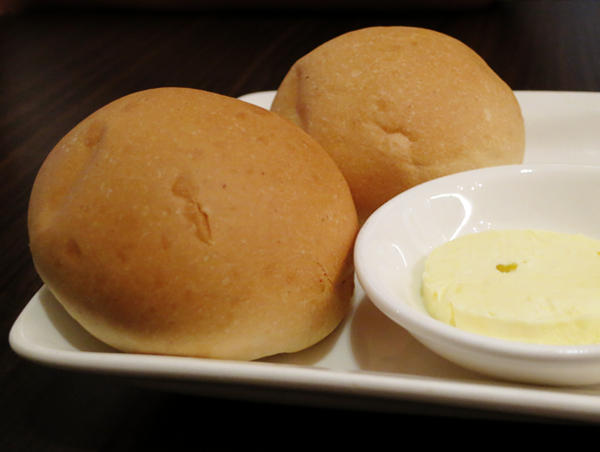 I'm an addict of Soft rolls ($2) and these came with unsalted butter. Soft (Duh!) and fresh, these made a great prelude to the meal ahead! 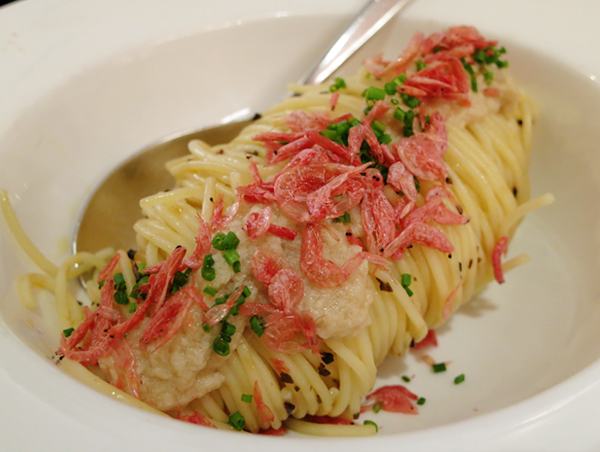 Angel Hair Pasta with Sherry Minced Pork and Sakura Ebi ($3.90) was one of the 2 dishes which the sister highly recommended. When the dish first came, I caught a whiff of the dish and whoo boy! The combination of the minced pork and ebi was really pungent to me. But the sis reassured me that it was nothing like it smelt. True enough, the first mouthful led to a second and within minutes, my plate was as clean as a whistle! The other dish that the sister insisted that we try was the Confit of Duck with Orange Segments and Sauté Shittake ($9.90). This was absolutely heavenly!!! The duck was crispy outside, without being charred. The inside was soft enough and slightly chewy. 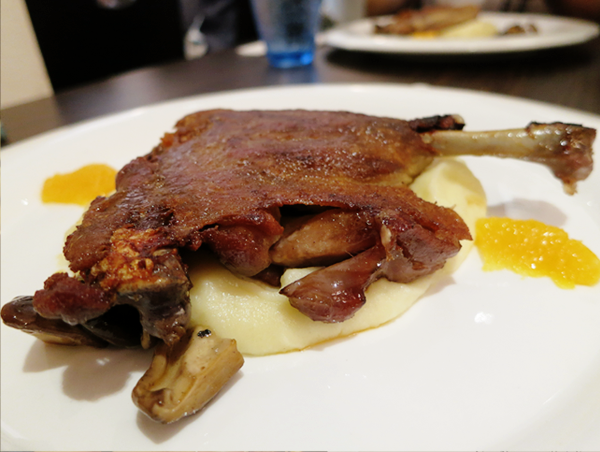 The duck lay on a soft pillow of mashed potato that went nicely with it but was a tad too much. Well, you can always choose not to finish it... Which was, of course, not something I did. I love mashed potatoes (I used to call them 'smashed potatoes'. Haha. Kids.)! I wish it came with more mushrooms though, because these little fungi were juicy and bursting with flavours! 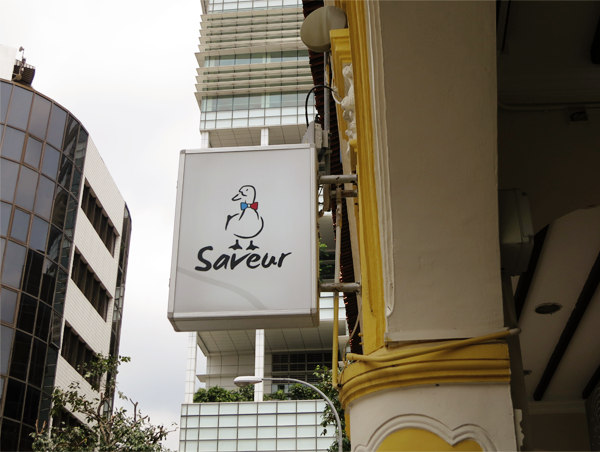 Saveur is a place for simple yet delectable French cuisine. Prices, as you can see, are unbelievably friendly. The portions may look small but as the axiom goes 'Don't judge a book by its cover.'. At the end of the meal, all our tummies were purring with satisfaction and we couldn't stuff another mouthful even though we really wanted to.